Hardcover with jacket, 864 pages, 15.0 x 22.7 cm, 5.9 x 8.9 in. May 6, 2013, saw the beginning at the Higher Regional Court in Munich of the trial of Beate Zschäpe and others thought to be connected with the series of murders by the NSU. This series of murders ended with the supposed suicide of Uwe Mundlos and Uwe Böhnhardt in their camper van in November 2011. Since Zschäpe's arrest and the unprecedented destruction of documents and the exposure of confidential informants, the authorities in charge of investigations and the German public have been puzzling over what exactly was happening in the right-wing scene in all the years between 1994 and 2011. 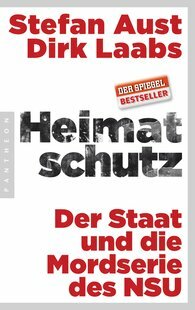 Where the trial has so far been unable to shed any light, Stefan Aust and Dirks Laabs have been all the more thorough with their research and have compiled a precise chronology of events of the almost unbelievable story of today's right-wing terrorism in Germany.